School’s out, but you’re not. Maybe the internship fell through, or maybe you planned to unwind this summer, but now your wallet’s feeling light and your house is suffocating. It might not be glamorous, but an entry-level summer job will fill those dragging hours and make you a little extra money. Here are some essential strategies for getting on the payroll. Start now by filing online job applications. Search for basic retail, food service and customer associate openings in your area on sites like Monster.com or Careerbuilders.com. I got my first job with Chick-Fil-A in high school using Snagajob.com, which specifically caters to hourly positions. If you already have something in mind—say you love animals and spend hours in your local PetSmart—go straight to the careers tab on that company’s website. It’s typically easy to file applications for open positions, but fair warning: pesky personality screening quizzes can be time consuming. There are a couple of reasons why walking the streets of your town is a good idea. You’ll see the “now hiring” signs in the windows of local businesses who don’t advertise online. These jobs might have less competition. Second, managers will often let you file an application even though they’re not hiring, which could become a callback if someone unexpectedly quits. I was once offered a job at a local ice cream shop for that reason. Finally, it lets the managers put a face to your name. A firm handshake, bright smile and clean-cut appearance are all reassuring marks of a potential good hire. None of those will come across on your paper app. I used to think that getting a job from your uncle or friend was cheating. But in reality, many managers hire because of personal connections. Both my younger brother and sister easily secured high school jobs at the same store I worked at because the owners knew me. Calling up a previous employer is also likely to produce results. It’s a lot easier for a hiring manager to pick someone they know—or someone who someone knows—than gamble on a random application from the stack. Start by seeking jobs that use your existing experience and skills. Did you waitress in high school? Think about catering opportunities. Were you a babysitter? Look into summer camps. Your background will put you a step ahead of other applicants. But think outside of formal work experience also, especially at the interview stage, where questions are more general. When did you last deal gracefully with difficult people? When have you tested your multitasking skills? Preparing for these questions ahead of time will help you make an excellent impression. My parents always told me this was key, and as much as it pains me to admit it, they were right. The first time I applied for an entry-level job late in high school, I filed over 50 applications online but was too shy to walk into any of the stores and introduce myself to the manager. It took me three and a half months to get hired. 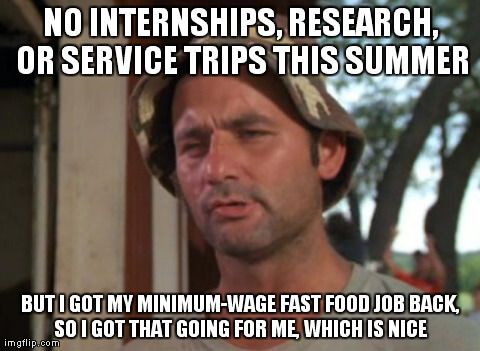 This summer, faced with steep New York City rent, I didn’t have the luxury of time, so I sucked it up, put on a nice outfit, made a list of the places I’d applied to and started shaking hands. In one week, I got five interviews and was offered two jobs. Persistence truly pays off. At this point you might be thinking, “This is great, but if I have to flip one more burger in my lifetime, it will shrivel my soul.” If this is you, consider strategic unemployment. Adult life doesn’t have summer vacations; these three months are a unique chance to devote yourself to something that really interests you. You could design and maintain a blog on your personal website or work on a startup business. Write some stories or poetry, and submit them for publication. Almost anything is game—just make your summer something you can brag about later, maybe even to potential employers. You don’t need a paycheck to acquire resume-worthy skills. Whether you start online, walk into a local shop or call up a relative, summer employment is a lot easier to find than it first appears. And if you choose to invent your own summer pastime, you have the benefit of being your own boss, so the sky is truly the limit. Having something to pass the time before you return to college social life can be a real mood-lifter, and the pocket change is never bad. Put your mind to it and think creatively: a surprisingly rewarding summer may be lurking in the most unexpected places. Need more inspiration? Check out our list of high-paying summer jobs.